Successfully Added Titan - Quadband Touchscreen Projector Phone + TV to your Shopping Cart. 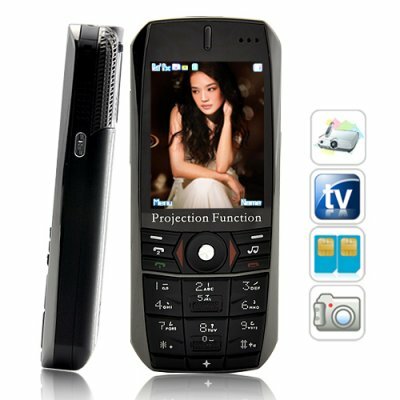 Unlocked quadband TV projector cellphone. This cellphone is an all round entertainment powerhouse that comes packed with dual SIM, dual standby, TV, FM Radio, LED Projector head and a simple user menu interface for flawless user navigation. With its unique style, the Titan TV projector cellphone comes with an LED projector with manual focus, analog TV, FM Radio, video recording, digital camera, picture viewing, Dual SIM, Bluetooth, and a user friendly menu interface for easy navigation. The Titan projector mobile phone is a 2-in-1 device that performs both functions exceptionally. This baby throws up images reaching up to 31 inches from a distance of over 2 meters away, and projecting clear image quality, rich colors, and a sharp 640x480 resolution that makes the Titan one of the best handheld projectors available. Don't forget, this amazing projector is also a phone! The phone is a high-powered, feature-rich personal communication and entertainment device with Bluetooth functionality to give you that added convenience of hands free calling. The highly responsive touchscreen and keypad makes navigation quick and easy, and don't forget to take advantage of the phone's camera, video and music player to relax between presentations or to project video clips and holiday photos to share with everyone around you. A combination of high-tech functionality, portability, and convenience makes the Titan unlocked Projector Phone a guaranteed hit! Buy one for your presentations and entertainment needs and amaze your audience. Buy in bulk for your store or online shop and be the first to introduce this product to your customers. As always, Chinavasion brings you the latest high-tech gadgets at the best factory-direct prices. NOTE: This product is compatible with GSM at the four frequencies of 850MHz, 900MHz, 1800MHz, 1900MHz. This China Mobile Phone can be used throughout the world. Does This projector phone have a quick switch button? Yes, there is a button on the right side of the phone, long press this button and you will be able to switch modes instantly. Does this Projector Phone come with a stylus? This projector phone is very touch sensitive and comes with a key pad as well, a stylus will only hold you back.